The Northeast tour takes you to some of the most exotic destinations that will stay encased in your memories for the lifetime. The passionate surroundings, gusty winds and excitement that are hidden in these destinations turn your dream for that perfect holiday into reality. The region is famous for its lush green tea plantations, verdant meadows and a beautiful township. The low hilly terrain of Darjeeling provides it with a serene and scenic beauty. 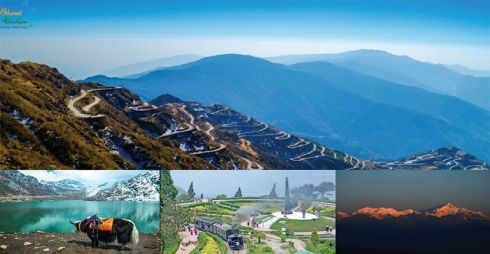 Some of the most attractive are spectacular Sunrise from Tiger Hill, the Monasteries, The Dhirdham Temple, Ghoom Monastery and every green tea plantation also attractions of Tsomgo Lake. Morning breakfast - Places of visit are Rimbi waterfalls, Rimbi Rock Garden, Kechopalri Lake, it is one of the holy Buddhist lake and it is believed that any wish in front of the lake comes true - Myth is that when a leaf falls on the placid clear water surface, it is picked by a bird and thus the water surface is always free of leaves, Kechopalri Monastery, Kanchenjunga water Falls etc – Back to hotel – After lunch transfer to Darjeeling - Nearly 110 kilometers 4 hours drive – At an height of 2123 meters / 70001 feet lies the land of breathtaking beauty, sloping tea gardens with spectacular views of the Mount Everest is the Queen of the hills – It is also home to the famous World Heritage train – The Darjeeling Himalayan Railway (DHR) - Check into hotel - Overnight stay at Darjeeling. Morning breakfast - After breakfast transfer to NJP / Bagdogra Airport (IXB) - Nearly 80 kilometers 3 hours drive – Guest are advised to start early and not to rush - Forwarding Journey. Note: We provide 01 Non A/C Alto / Indica / Wagon R for 02-03 pax including child & Sumo / Bolero / Max for 04-08 pax including child in all categories. Supplement cost for A/C Innova / Xylo @ Rs. 8000 only per vehicle with maximum capacity of 6 pax For North Sikkim tour & 7 pax for all other tour. Supplement cost for lunch @ Rs. 250 per person per meal. · Entry fee at Sightseeing places & any expenses of personal nature and expenses occurred due to force majeure factor. The decrease in the number of persons would increase the cost of the package. The quote is not valid during the festive period. Supplement for the same will be extra as per applicable. The quote is based on an online portal which is not static we would request you to confirm at the earliest. The price and availability is subject to change without prior notice. Hotels rooms are subject to availability at the time of confirmation. In case of unavailability of the rooms, we will provide the similar hotels/Camps. All dispute will subject to Delhi jurisdiction only.